A chilled bottle is split between two mini pint glasses. I’ll admit that I bought this beer simply because of the label. Skeleton in a sombrero! If you are familiar with the album art for Ry Cooder’s Chicken Skin Music, you’ll know why I like this label so much. Hazy straw colored liquid has a thin white foam head. It settles to a skim with a few large bubbles mixed in. Swirling the beer causes the head to foam back up. It also leaves a few spots of foam on the walls of the glass. The beer has a decent wheat aroma. 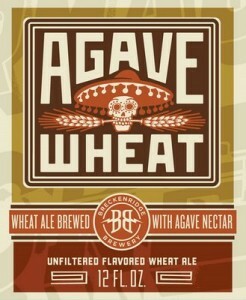 I’m not sure if I am smelling any agave nectar, as I don’t know what it smells like. There certainly isn’t any odor of death rot, despite what the label lead me to believe. This beer has a very interesting taste. There is certainly plenty of wheat, with some banana and crystal sugars. There is a spiciness that is unlike other beers I’ve had. It has a real kick at the finish that reminds me slightly of tequila. It’s probably just because I know there is agave in there that I make this connection. Either way, I like it. Medium body and carbonation. 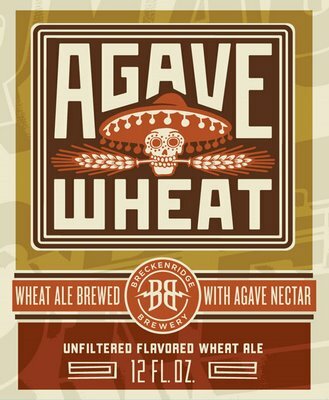 The tongue is tickled a lot by the beer—once again, probably the agave nectar at work. Not much coat or stickiness to mention. I really enjoy this beer. It’s nice and refreshing. If it were readily available here in Maine, I think I’d drink a lot of this during the summer. If you have a chance to try this one, I recommend it! I picked up a can of this beer a couple of weeks ago while in Massachusetts. It has been sitting in my cellar, but I popped it into the fridge to chill it slightly before pouring. It’s poured into my Lion’s Pride snifter. The beer is very clear and colored dark orange. The occasional carbonation bubble can be seen rising form the bottom of the glass. The head is slightly darker than pure white, and foamy. Great lacing as the head recedes. Swirling the glass leaves a foamy film coating the sides. It’s very pretty. Warm alcohol and warmer hops make up the aroma. Sweet citrus hops are predominant. It certainly smells bigger than a regular IPA, but I would believe you if you told me it belonged to a hoppy barleywine. While this beer tastes hoppy, it isn’t as powerful as the nose lead me to believe…there’s also a lot of maltiness here. Some sweet grains make themselves known, but the bitter hops fight for dominance, and end up winning, completely taking over by the time I swallow. Warm alcohol is there after I swallow. I guess there is a little bit of oak mixed in as well, but I don’t find it to be very strong. Still, a tasty beverage. This beer, while not heavy, does have a heavier than normal body. Carbonation is high, but it does foam up a lot in my mouth (maybe I should have let it chill a bit longer). There is some stickiness, but it is easily ignored. Plenty of warmth is provided by the alcohol, and it also provides a sharp bite, along with the hops. This is a pretty enjoyable DIPA. It’s a bit strong, so I wouldn’t end up having too many of these. Also, it has to make the long journey across the country for me to enjoy it. I find there are comparable beers more local to me. I’ll probably choose them in the future, but if I do find myself back in 21rst Amendment’s distribution area, I wouldn’t skip over this beer. A cellar temperature bottle is poured into tulip glass. The beer is a fine copper color with a few streams of carbonation rising from the bottom of the glass. The head is large, foam and varies in color from white at the top to egg shell tan at the bottom. A good amount of lace is left behind as I swirl the glass about. Big pine hop aroma, with a touch of alcohol and crystaline sugar sweetness. Very appealing. There is a big hop flavor to Larry, but not as big as many DIPAs. Bitterness is everywhere, but it isn’t sharp or very oily. There’s plenty of pink grapefruit without being acidic. Alcohol isn’t apparent, nor is there a lot of sugar. The body of this beer is on the heavier side of medium, and carbonation is just slightly above average. All the tiny bubbles work well with the hops. A long lasting coat is barely felt; it’s more like lingering flavor. No stickiness on the lips makes this drinker happy. This is a very good DIPA. Its too bad I had to drive to MA to get a bottle. If you find yourself within Wachusett’s distribution range, I suggest you get yourself a bottle. A recent purchase, I picked this up at Julio’s on July 3rd. It was bottled in May 2011 (batch 26). It is served at cellar temperature in my Smuttynose Big Beer Series tulip. A nearly clear golden yellow liquid fills the glass. Atop it rests a small head of pure white foam. A good amount of tiny carbonation bubbles can be viewed within. Swirling the beer brings the head back and coats the walls with a god amount of film and foam. The aroma on this beer reminds me a lot of a wit. There’s banana and clove, as well plenty of funky farmhouse yeast. It may not be the standard scent for this style, but I like it a lot. There are a lot of complex flavors going on here. It starts out with Belgian candi sugar, but this is quickly eclipsed by some banana and grassy hops. The banana is even more prominent as I swallow. Crisp sweetness lingers on for a long time after the beer is gone. The beer is a bit ticker and offers more coat than I expected; I think I’m a little disappointed actually. I prefer a crisper saison. I like this beer. It is a bit heavy on the banana, but I don’t mind that. I would definitely drink this one again. A slightly chilled can is poured into a pint glass. The beer is colored orange. It initially poured clear, but some yeast settlement came out at the very end, giving a hazy quality to the beer. Rising carbonation can still be seen rising within. The head is colored off-white and made up of medium to large bubbles. Sea Hag has a nice hoppy aroma. It is warm and citrusy. The beer has a fresh, sharp hop flavor with plenty of bitter oils. There is certainly plenty of grapefruit flavors, but also some pine. A bit of pale malt sweetness stands behind the hop bitterenss and eventually blends in by the time I swallow. More subtle bitter flavors linger. Medium bodied with average carbonation. A bit of an oily coat remains after I swallow. All of the hops feel sharp on my tongue. This is an enjoyable IPA. Since cans can get into places where bottles can’t, Sea Hag could be the right choice based on your planned activities. I don’t think I’d trade for this beer, but when I’m in MA again, I’d certainly pick up a few cans. I picked up a bunch of beers this past weekend when I made my first stop to Julio’s. One item I took home was a single can of a beer Luke is able to enjoy on a regular basis out in San Francisco. A cellar temperature can is poured into a pint glass. The beer is slightly hazy and has the color of tarnished gold. A few fingers worth of off-white foam rises out of the liquid, but it doesn’t stay for long. Already the bubbles that make it up are popping. Eventually, all that is left is a skim of foam. No lacing is left behind. Lots of carbonation bubbles are rising within the glass. The beer has a sweet wheat aroma. I can smell watermelon, but I’m not sure I would have been able to identify the scent if I didn’t know this beer had the fruit in it. This is a sweet, fruity beer. Some aspects of its wheat base are apparent, especially as I swallow. Mostly I taste sweet watermelon flavors, like a piece of candy. There may be a hint of bitterness as soon as I taste the beer, but if it is there, it is gone quickly. For a summer beer, this one sits heavy in my mouth. A lot of foamy carbonation is present, and the coating is thick and sticky. Overall, this isn’t a beer I’d go back to. I prefer a lighter wheat beer for a summer seasonal, and I’m not a fan of watermelon the fruit, so watermelon the beer probably isn’t for me either. Still, its an interesting and commendable experiment.